Satanists in Missouri: They argue that the state's waiting period for abortion violates their religious beliefs. It was the will of Satan (shown here partying in Sacatepequez, Guatemala, last year) that decided Roe v. Wade. Conservatives are increasingly citing their right to religious liberty to defend using state property to proselytize and disobey laws protecting women and LGBTQ people from discrimination. But those efforts are getting a little more complicated, thanks to a group of pranksters who claim to worship Satan. 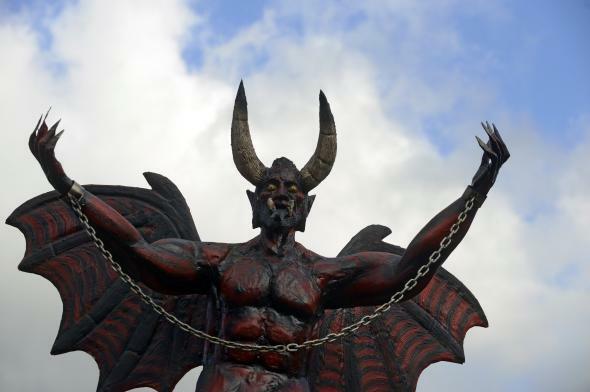 Whenever Christians erect Christian monuments on state property or distribute religious materials at public schools, the New York–based Satanic Temple is there doing its part, passing out satanic materials or erecting statues celebrating Satan. Now these expert trolls are tackling anti-abortion regulations, which they claim violate satanic religious beliefs; followers of the king of hell should be allowed to opt out of those regulations, they say. Satanists are rallying around “Mary,” who lives in rural Missouri and needs an abortion but is struggling to afford the extra expenses that the state’s 72-hour waiting period will impose on her. Mary has the money for the abortion, but she doesn’t have the estimated extra $800 that she needs to travel to the only abortion clinic in the state, in St. Louis, a trip that will require gas, hotel, and child care. “I personally would have liked to have the procedure done as soon as possible,” Mary told the Riverfront Times. “But with all the difficulties, how hard it is do this, it’s been put off for several weeks.” She’s now nearly 12 weeks pregnant. The Satanic Temple raised the money for Mary in a day; its plan is to present a letter to the abortion provider asking for an exemption on the grounds that, as a Satanist, Mary believes her body is “inviolable” and the waiting period imposes a “substantial burden on my sincerely held religious beliefs.” As a legal maneuver, this leaves much to be desired: The clinic, too, is being victimized by the regulation, and they’re not the authorities standing between Mary and her abortion. The legally sound way to demand “religious liberty” exemptions to waiting periods is sue the state government, but the Satanists don’t have those sorts of resources—they’re not Hobby Lobby. While the Satanists did misfire by taking aim at the clinic, as a public act of trolling, this stunt gets an A-plus. It exposes the double standards of those who claim to stand for “religious freedom,” and it highlights how waiting periods and other restrictions are actually an attempt to impose religious dogma about abortion on those who don’t agree with it. Being denied medical care is actual religious oppression. Letting someone access her own medical care is not.